The cool factor surrounding station wagons has waxed and waned over the decades. Wagons like the Chevy Nomad and the fabled Woodies of yesteryear have been on the cool radar for some time, although America’s affair with the wagon was definitely derailed by the onset of the SUV. Crossovers are the new “hot” thing, bringing station wagons back into the spotlight. GM is planning a CTS-V wagon of its own. But what if Ford jumped on the bandwagon? This rendered speculation of an SHO wagon comes from Autoblog via designer Josiah Lacolla’s website. This is an excellent speculation, and we’re hoping someone over at Ford is looking too. Unlike previous iterations of the Taurus, there is currently no station wagon model available. The Taurus-X, which was actually just a renamed Freestyle, was quite a popular motor before it was discontinued in favor of the new platform Taurus. Josiah is no stranger to design, having rendered a C7 Corvette for Automobile Magazine and having had two cars on display at two consecutive SEMA shows. In many ways the current Taurus lends itself to a wagon. It is a huge, heavy car already, and could probably fit quite a bit of cargo in that rendered rear end. With the 3.5 liter 365 horsepower EcoBoost engine, it would also make driving the kids to soccer practice a lot more entertaining. There is plenty of competition in the wagon market already, and the CTS-V wagon will likely make almost 200 horsepower more than an SHO wagon, if Ford ever made it. Maybe the new Mustang 5.0 V8 instead? We won’t hold our breath, but Ford, if you’re listening…you need to build a SHO wagon! Boss 302R Engine Heading To Production Cars? It is no secret that the technology found in racing engines often trickles down to production cars. 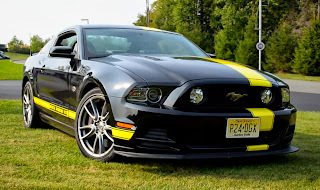 The Boss 302R Mustang straddles a fine line between production car and race car. It comes pre-built from the factory to compete in events like the Mustang Challenge and Grand-Am series, but it isn’t designed for on road use. Still, it also isn’t that far removed from a road-going daily driver. The Mustang News seems to think that the Boss 302R could translate into a Boss 302 street Mustang, and they make a strong argument for their case. The first point the Mustang News makes is the 302R’s unique intake manifold. The manifold is taller than the one found on the 2011 GT’s 5.0 liter engine. The manifold also has indentations that would fit an engine strut brace and Boss 302 emblems. There are also ribs on the manifold…more a dress-up option than necessary for a race car. The throttle body and air-intake box also feature all the tabs necessary for vacuum lines and the factory acoustic tube that increases the sound of the V8 inside the Mustang’s cabin. A point we’d like to make is that if Ford is really going to bring back the Boss, they would be foolish to make just 50 of the cars as they are with the 302R. The Boss name still carries a lot of weight, even though it has been forty years since the name appeared on an American Mustang. Slip it in somewhere between the Mustang GT and Shelby GT500 in terms of cost and horsepower, and you’d have a real winner on your hands. Rally driving is not for the faint of heart, and Ken Block is just about as fearless as they come. After getting just a single test run behind the wheel of his M-Sport-built WRC spec Focus Rally Car, Block headed south of the border to take on some of Mexico’s toughest roads. And he did very, very well in the beginning, running just seconds behind some WRC veterans like Jari-Matti Latvala, who is in his tenth year of rallying. Unfortunately, as the Monster World Rally Blog describes, Block pushed the Focus a bit too hard around a tight right turn, and would up deep in a Mexican ditch. The accident broke the front control arm, effectively taking the car out of the race. Block insists the car had a lot more to give and he was hardly pushing it. And pushing is what nabs trophies. Push the Focus he did, and unfortunately a lack of practice time probably contributed to the crash. But don’t count Block out yet. He still has last week’s 100 Acre Wood Rally victory, his fifth in a row, and the first for the rally-spec Fiesta. The weekend in Mexico wasn’t good for Ford at all in fact. Rather a trio of Citroens took the 1-2-3 spot, with the BP Abu Dhabi Ford Focus cars coming in fourth and fifth. But it was the first outing for Ken Block behind the wheel. Block wound up finishing the race, coming in 18th place, but this year is more about getting used to the new cars (as Block once drove for Subaru). Next year, we’ll be expecting a lot more first place finishes. March is turning out to be a great month for Jack Roush Sr. Roush has a long and successful motorsports history with the first of his numerous championships coming in drag racing. Roush celebrated a racing milestone last Sunday at Homestead-Miami Speedway when his son, Jack Roush Jr., and co-driver Billy Johnson won the Homestead 200 (GS Class) Continental Tire Sports Car Challenge. The win marked the 400th all-time victory for Roush Sr. in road racing and NASCAR combined. In addition to the highly-visible NASCAR entries of Roush Fenway Racing, Jack Roush also has a number of automotive-related companies in his hometown of Livonia, MI. Among them is ROUSH Industries, a Tier One supplier of engineering, testing and manufacturing services to all the Big Three manufacturers, and ROUSH Performance which produces high-performance vehicles, parts and exotic crate engines. Roush has previously been inducted into the National Motorsports Press Association Hall of Fame (2010), the Michigan Sports Hall of Fame (2008), the International Motorsports Hall of Fame (2006), the Mustang Hall of Fame (2002), and the Michigan Motorsports Hall of Fame (1992). Earlier this year Roush also was one of five recipients of a coveted 2010 Distinguished Service Citation from the Automotive Hall of Fame in Dearborn, MI. The award recognizes an individual who has significantly improved the industry or their respective organization. Roush’s history of innovation will be extended this season as his daughter, Susan Roush McClenaghan, and drag racing veteran Donnie Bowles will campaign a pair of Roush-engineered, propane-powered cars in the NMRA Ford Nationals. JMS Chip & Performance has just released their JMS Dominator SN197 rear brake kit. This kit includes coated/drilled rotors, caliper relocation brackets, ABS brackets, and all of the mounting hardware. This kit will fit on 05 and up Mustang GT and GT500s. This brake kit allows the use of 15 inch rear wheels on any S197 Mustang GT or GT500. SN197 owners can now take advantage of the various drag radial and slick sizes available for 15 inch wheels. You can now run a tire with enough sidewall to get even the highest horsepower S197’s down the street or track. This kit contains: coated/drilled rotors, caliper relocation brackets, abs brackets, mounting hardware and detailed instructions. Retail Price is $219.00. Dealer inquires welcome. For more information go to www.jmschip.com or call JMS Chip & Performance at 601-766-9424. FAST has developed new crank triggers for Ford and Chevy applications. The new crank triggers will help eliminate the possibility of inaccurate rpm measurements. This new component is made from ASTM A36 grade steel that is stronger than the OE style aluminum pieces. Recently, engineers at FAST turned to the OEMs to see what they trust in the way of rpm-measuring crank triggers for their 400 and 500 horsepower daily drivers. Until now, flying magnetic trigger wheels with bulky inductive pickups have been used with the risk of broken magnets or losing magnets at high engine rpm. Now FAST has a better answer. A magnet-free device, this new piece from FAST includes a wheel constructed from ASTM A36 grade steel that is so strong that it only needs to be .125″ thick and is virtually indestructible. With the wheel being this thin, it not only weighs less but requires less space than competitors aluminum versions. And the FAST inductive sensor is also much smaller than others on the market and is hermetically sealed with the connector molded into the body. The key to the crank triggers dependability and accuracy lies in the trigger wheel design. Rather than having added magnets, the wheel has tabs on the outer rim. These tabs are measured by the inductive sensor as the wheel revolves, which then provides data to the fuel injection and ignition systems for accurate rpm measurement. And because the tabs are a part of the single wheel unit, there is no possibility of loss or fragmentation as with the magnetic style trigger wheels. This sensor is used by OEMs both on and inside the engine and provides long-lasting, accurate timing. Installation is straight forward, and everything required is included. For those already using the FAST XFI system, its a plug and play unit. In addition, its compatible with many other EFI systems on the market. For more information about the FAST Crank Trigger or any other FAST product, call us at 1-877-334-8355, or visit us online at www.fuelairspark.com. When Ford Motor Company announced the return of the Ford GT, which was stemmed from the early racing days, many collectors flourished at the opportunity to gain ownership. The 500 horsepower 5.4-liter V8 was wrapped inside classic Le Mans styling with a five speed manual transmission. The price tag came in at just over $139,000 and it seemed to be no bearing on those who truly wanted to own a piece of history. With carbon fiber and aluminum at an abundance throughout the construction of the GT, it was evident that it was designed for speed. Speed may be an understatement when you see what Dan Schoneck has been up to for the last year. Yellowbullet.com never ceases to amaze us for the type of creations that the members put together. Dan Schoneck is no different in this case, Just check out his post on YB to see all the feed back that he has recieved on his Ford GT. The fabrication work is absolutely amazing on Dan Schoneck’s Ford GT. Dan Schoneck may sound familiar to racers and you will most likely know him from his work with his company Schoneck Composites. They construct some of the nicest carbon fiber and fiberglass body panels on the market. It appears that Dan’s skills don’t stop at carbon fiber from judging by the appearance of his supercar. Dan started with a 2005 Ford GT and a dream of having a stress reliever car. His intentions were and still are to run this car on the Texas Mile at over 250mph. The 5.4-liter has been modified with a larger bore punching it out to 358 cubic inches along with a billet crankshaft designed by Dan himself. Running 11.5:1 compression will require upgraded internals so Schoneck relied on Diamond Pistons and Manley billet rods. Even the wheels are custom one off pieces. The rears measure 21″x13″ wrapped with Pirelli rubber. Estimated horsepower numbers are around 1600 horsepower while maintaining drivability on the street will be a challenge but with the help of E85 fuel all should be just fine. Adding the boost will be a Procharger F2 and handling all that power will be a Liberty prepared transmission along with a carbon fiber driveshaft. Most notably will be the reproduction of all the body panels in carbon fiber by Dan himself. This should help cut the weight several hundred pounds. Every year Edelbrock helps put on a show with the Center for Learning Unlimited to help support children with learning disabilities. The date as has been set for the 2010 event which will include a car show, music, and other events. Check out the press release below! TORRANCE, CA – Edelbrock and the Center for Learning Unlimited have once again teamed up in support of helping children with learning disabilities to present the 5th Annual Rev’ved Up 4 Kidz VIP gala charity auction and car show, April 24-25, 2010. The weekend kicks off Saturday evening as Christi Edelbrock, Edelbrock Vice President of Purchasing and event organizer, hosts a special gala dinner and charity auction at “Vic’s Garage” located within Edelbrock’s facility in Torrance, CA. This fundraiser includes an evening of classic cars, a VIP dinner, live and silent auction, entertainment and celebrity guest appearances. Tickets are $125, with a 10% discount on reservations for tables of 10. Organizers are currently seeking silent auction items and corporate donations. Please contact Ginny Erxleben Mathews for more information, (310) 544-1644. Sunday Edelbrock hosts the Rev’ved Up 4 Kidz Car Show. All makes and models are welcome and interested participants can pre-register at www.revvedup4kidz.com. Cost for car entry participation is $40.00 (advance) or $45.00 (day of show). A special VIP area is also available in front of the main stage for $100.00 entry fee. Show hours are 10:00 a.m. to 3:00 p.m. and space is limited. Spectator entry is free however $5.00 donations will be accepted and appreciated. Vendor space is available and vendors are welcomed. The 2010 Rev’ved Up 4 Kidz Charity car show will host 2nd annual Hot Rodders of Tomorrow Engine Challenge Regional competition. Local high school students will compete in a high-energy engine building competition. The top teams from each region will earn their spot to compete at the National Finals in Las Vegas in the “Showdown at SEMA” in November. The top teams are honored with scholarships from Ohio Technical College and University of Northwestern Ohio. All event proceeds go to the Center for Learning Unlimited. VP Racing Fuels has just added a new fuel to their arsenal. The new CHP fuel stands for Crate HorsePower, and it will give the racer the benefit of a wide tuning window. The CHP does run 4-7% richer than other fuels due to its oxygenation.